The Bible is not a single book, but a collection of books written throughout a period lasting more than a thousand years. 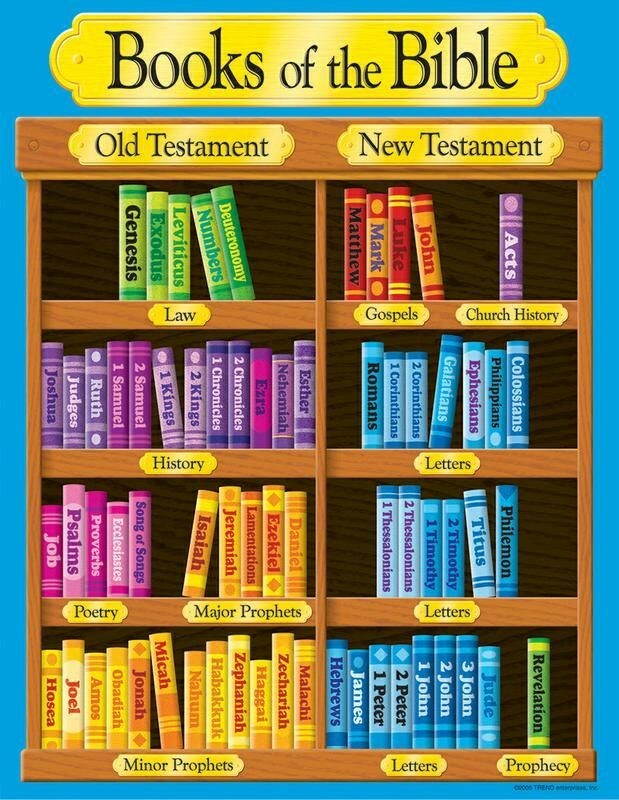 There are also a variety of different kinds of books in the Bible—histories, a song book, biographies, letters, and more. Understanding the Bible can be difficult if one does not know why these different kinds of books are included and what we are supposed to do with them. This article will give a simple overview of the different parts of the Bible and explain briefly how to approach its different books. Most people understand that the Bible is divided into two major parts, the Old and New Testaments. The Old Testament actually takes up a bit more than three-fourths of the Bible. From a Christian standpoint, the Old Testament books, which were written over a period of many centuries ending roughly 400 years before the coming of Jesus Christ, lay the foundation for understanding him. The New Testament books, which were written within less than a hundred years after Christ’s death and resurrection, preserve the apostles’ memories of what Jesus did and taught, and they explain what it all means in the light of the Old Testament. Most Christians find the Old Testament to be more difficult to read and appreciate. However, it is worth the effort, because there is a great deal in the New Testament that you will understand better if you have a basic understanding of the Old Testament. They are both the word of God, inspired by the Holy Spirit so that we will know God in an authentic and life-giving way (see John 20:30-31; 2 Timothy 3:15-17; 2 Peter 1:20-21). There is a lot of historical narrative in the Bible. Genesis and much of Exodus and Numbers are history, as are the books from Joshua through Esther. The Book of Acts in the New Testament is also history. In general, you can tell that these books are meant to report history and are not myths or legends by the way the narratives are written. The authors usually refer to a lot of specific places, give the names of the kings or other important figures living at the time, and even date events, usually by stating in what year of a particular king an event took place (e.g., Luke 2:1-2). Scholars have verified a surprisingly large number of these details from sources outside the Bible, such as court records from neighboring nations, monuments, and all sorts of archaeological finds. Admittedly, the status of Genesis 1-11 as history is highly controversial. It deals with events so long ago—before the invention of writing—that it is difficult to confirm its accounts of the distant past. Of course, there is a great deal of debate about how to compare the accounts of creation in Genesis 1-2 with the findings and theories of modern science. Without trying to resolve all of those questions here, we can focus our reading of Genesis 1-11 on the two main purposes of those chapters. First, Genesis 1-11 lays the foundational elements of the biblical worldview: God is one transcendent Creator who brought all things into existence; God created human beings to have a special relationship with him; by our own fault we have become alienated from God, morally corrupt, and mortal; and God has not abandoned the human race but is at work to restore us to our intended relationship with him. Second, Genesis 1-11 provides the backdrop for Abraham, the founding patriarch of the people of Israel, explaining where he originated and what the world was like when God revealed himself to Abraham. With the biblical histories, the main point for the reader is to follow the storyline, the “action,” and grasp the overall flow of events that were important to Israel’s history and to the beginning of the Christian church. As you read through these books, you might slow down when it reports a speech by a prophet or apostle, because these will often have some meaty teaching. Also watch for “editorial comments” by the author in which he tells his readers why something happened or what it meant. The four Gospels in the New Testament (Matthew, Mark, Luke, and John) are biographies, a special form of historical text written in the style of biographies in the ancient Greco-Roman world. As was typical of such ancient biographies, the Gospels say very little about Jesus’ childhood and focus on the most eventful period of his life. The purpose of an ancient biography was to tell the truth about an important person so that readers would know who he was, what he did, and what values or character he displayed. If that individual was a teacher, the biography would also include examples of his teaching. Here again, the claim commonly made by skeptics that the Gospels are myths simply does not hold up. Since the Gospels are biographies, the main point of reading them is to get to know their subject—Jesus. As you read them, pay attention to the way Jesus interacts with people. Sometimes he is compassionate toward others, and sometimes, frankly, he gets angry with them. Try to put yourself into the narrative, perhaps imagining yourself in the crowd or as one of the disciples following Jesus from place to place. Feel free to “camp” on a particular passage, to wrestle with its meaning or to meditate on something profound Jesus says. Most Christians, for good reason, view the Gospels as the heart of the Bible. They are worth reading over and over again. A large portion of the Pentateuch consists of laws that God gave to Israel to be the basis for their legal system (most of Exodus 20-40; Leviticus; Deuteronomy 14-26). These laws express the requirements that God placed on ancient Israel under what is later called the “old covenant” (which is the actual meaning of the term Old Testament). A covenant was essentially a contract, and the covenant that God made with Israel through Moses took the form of a treaty, like ancient treaties that a powerful king would make with a neighboring nation. We don’t live under that covenant, so we don’t have the same legal system. However, those laws reflect God’s moral law, so we can and should read them to gain an appreciation for what God considers right and wrong. The New Testament also gives some important guidance to Christians to understand what has changed, and what has not, now that Christ has come and inaugurated the “new covenant” (which is the meaning of the term New Testament). If you run across something in those laws that seems strange or harsh, keep two things in mind. First, Israel was called to be a special nation in a culture swimming with child sacrifice, superstition, and gross immorality. The Canaanites and other peoples of the region three thousand years ago were a rough bunch. Second, some of the laws that seem odd to modern readers made good sense to the ancient Israelites, either because they kept them from getting sick or in trouble or because they had symbolic significance that was meaningful in that culture. The Bible does not contain any written music, but it contains a lot of songs. In fact, the longest book of the Bible is a collection of songs, called Psalms. There are songs or psalms (which could be spoken as well as literally sung) in many other parts of the Bible, including Luke 1 (most famously Mary’s “Magnificat”) and the Book of Revelation. Songs may contain teaching, but they are primarily expressions of emotion. The psalmist sang songs to God crying out for help, thanking God for blessings, and lamenting his suffering or that of the people of Israel. They teach us not only by what they say but by showing us how to pray—to be transparent with God, trusting him to hear us, admitting even when we are finding it difficult to trust God. Millions of people have memorized the 23rd Psalm and have found themselves reciting it in times of darkness. Ancient Hebrew poetry made heavy use of different kinds of parallelism, in which two (or three) lines might be saying something similar in different ways, expressing contrasts (for example, contrasting good with evil), or forming a progression of thought. As you read the poetic parts of the Bible, you’ll get used to these literary devices. Be careful not to overanalyze them or take imagery too literally, because like all poetry the language is chosen at least partly for emotional effect and to create pictures in the mind. The Bible has a whole book called Proverbs, and there are individual proverbs or other kinds of short sayings in other parts of the Bible. Probably the most common mistake people make with proverbs is treating them as iron-clad cosmic laws: Do X, and Y will always be the result. That’s not the point of a proverb. Proverbs are short, easily remembered expressions of wisdom that give generalized guidelines about the best way to live your life. By the way, Proverbs 1-9 is a lengthy poetic introduction to the proverbs, which actually start in Proverbs 10. Most of the biblical proverbs are written in the same kind of poetic style as the psalms. There is prophecy throughout the Bible, but the prophetic literature includes most of the books of the Old Testament from Isaiah through Malachi as well as the Book of Revelation. The Old Testament books of the prophets contain a mixture of prose (straightforward speech) and Hebrew poetry. The focus of these books is usually the need for the people in the northern kingdom of Israel or in Judah, the tribal region in the south around Jerusalem, to repent of their violations of the covenant that God had made with them through Moses. For that reason, you’ll understand the issues in these books better if you are familiar with the history in Kings and Chronicles. They are warned of chastisement and even destruction if they do not stop worshiping idols, sacrificing children on altars of fire to false gods, or letting injustice in the land go unchecked. The prophets also let the people know that God would not let the other nations get away with evil against them, either. Through these warnings by the prophets of what was coming, the Lord gave the Jews further evidence that he was the true God. Some of these prophecies about the future also pointed forward to the coming of Jesus, authenticating him as the true Messiah. Biblical prophetic literature contains two especially noteworthy kinds of material. Oracles are statements made by God through the prophet, typically introduced by the words “Thus says the Lord.” Visions are symbolic images and stories, often introduced with expressions such as “And I saw” or “And I looked, and behold,” that picture the spiritual activities of God, angels, or evil spirits going on behind the scenes or dream-like representations of what is going to happen in the near or distant future. The books of Ezekiel, Daniel, and Zechariah are dominated by these last kinds of visions. Frequently the author explains to the reader what some of the symbolic elements of these visions represent, so look for those explanations. Parables are relatively short, simple stories told to illustrate a point or answer a question. They are not about real people or actual events. There is no book containing only parables; most of the parables of the Bible are stories told by Jesus in the Gospels. Most of Jesus’ parables are not allegories, in which many different elements are symbolic of specific things, but at least one is—the parable of the sower and the four soils. A parable is an indirect form of teaching: instead of telling someone what to think or how to act, the teacher tells a story that makes the point clear for those who are open to it. The word epistle means a letter, often though not always a carefully composed one. There are just a few letters quoted in historical books in the Old Testament. At least 19 of the 27 books of the New Testament are epistles (Paul’s 13 epistles from Romans to Philemon, James, 1 and 2 Peter, 2–3 John, and Jude). The Book of Revelation, though dominated by prophetic visions, begins and ends in the form of an epistle. Hebrews and 1 John do not identify their authors or their original readers, so they are not exactly epistles; perhaps we could call them literary sermons. All of Paul’s epistles are messages to churches or Christian leaders. In these epistles, Paul may be answering questions from a church, writing to address false doctrines or other issues he has learned have arisen in a church, encouraging a church to continue doing well, or giving young leaders instructions in how to handle some pastoral concerns. In several of his epistles to churches, he begins with doctrinal teaching and in the last part of the letter focuses on practical concerns. You can sometimes get some helpful background for these epistles from reading Acts, which tells about Paul founding churches and working with other leaders. The other epistles are written for Christians over wider areas than just a city or a single church. Several of these epistles, particularly 2 Peter and Jude, were written as the apostolic era was gradually coming to an end. All of these “general epistles” urge Christians to be faithful to Christ in the way they live as pressures from ordinary life or even persecution challenge their confidence in the gospel. This is also the focus of Hebrews, which reads mostly like a sermon but with an epistle-like ending. For an excellent, readable book covering this subject in greater detail, I highly recommend Wayne Grudem, C. John Collins, and Thomas R. Schreiner, eds., Understanding the Big Picture of the Bible: A Guide to Reading the Bible Well (Wheaton, IL: Crossway, 2012). To obtain free copies of other articles in this series, please contact IRR at 600 West Street, Cedar Springs, MI 49319, or visit our website at http://bib.irr.org/category/bible-study.